How many days should I set aside for this trip? What are the places I should visit on my first trip to Switzerland? Should I rent a car or take the train? What rail pass should I buy? How do I split up my time? Should I visit the Top of Europe? Heads up: If you think going to Zurich and/or Geneva is seeing Switzerland, well I don’t think this guide will be of any use to you. However, if you want to give Switzerland the bare minimum of time it deserves, I would set aside at least a full week. A recommended schedule for most would be to leave on Friday (arrive Saturday morning into Switzerland) and come back on Sunday. This takes advantage of the weekends and gives you 7 full days in Switzerland + 1 day after you return to recuperate from any lingering jet lag. Short Answer: Given a one week window for a trip to Switzerland, here are the places I would visit (put on a map). Most visitors to Switzerland will arrive or depart Zurich Kloten Airport (the busiest in the country). Though Zurich and its old town are beautiful in their own right, this city usually just serves as the gateway to the country. I would bank on spending no more than 1 night in the town on your first trip. Located 45 minutes away from Zurich by train, Lucerne is the gateway to the Swiss Alps. It sits right in between the edge of the densely populated Swiss Plateau and the Alps. There is no finer CITY in Switzerland when it comes to charm, history, and natural beauty. The city sits on the lake of the very same name and you can very often gaze out at the Alps while roaming the streets of this city. In other words, if you really want to only visit cities, this would be the one to not miss out on. This mountain sits atop three lakes in Switzerland: Lucerne, Zug, and Lauerz and are served by some of Europe’s oldest mountain rail services. Visitors often flock to the heights of the nearby Mount Pilatus, and overlook Rigi, which offers a better look at the surrounding regions. There are also a significant number of trails leading up to and down from Rigi Kulm where you can take in all the beautiful alpine vistas you would like to. This sleepy little town located in the Canton of Ori, is the starting off point for the Glacier Express on this particular itinerary. The actual beginning/end point for the station is the town of St. Moritz near the Bernina Pass. Anyway the valley and town are definitely worth exploring while you wait on the next Glacier Express train, which will take you to Zermatt. This passenger train with panoramic windows can be referred to as a destination in itself. You just sit back, relax, and watch as some of the best Switzerland flies by outside your window. Do note that the train is coined “Glacier Express” not by the number of glaciers that go by, but the glacial manner in which it traverses the alpine passes of Switzerland. It definitely leaves you with a lot of time to soak it all in. The Glacier Express ends in Zermatt where you will come face to face with the iconic Matterhorn, perhaps the most recognizable symbol of the Alps. If you don’t know what I’m talking about, it’s the mountain you see on the cover of a Toblerone. The town sits at the foot of this iconic peak and serves as the pushing off point for many different hikes and scenic excursions into the region. More on the local attractions later. INSIDER TIP: AVOID INTERLAKEN, where most of the tour groups stay. While there are a few instances where a car may be better suited for your journey, if you are going to use the itinerary that I have laid out in this post, you should use the train. Just the tickets on the Glacier Express itself or any of the regional gondolas will often be more expensive than Swiss Travel Pass. And if you are getting on multiple means of public transport like ferries, tram cars, and more throughout your journey, there is no deny the value of this pass. 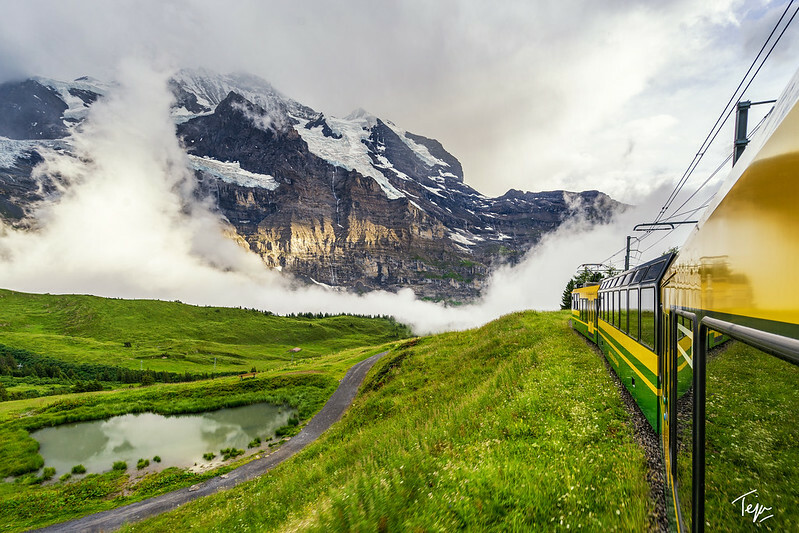 The pass includes 99% of all train rides, boat rides, and bus rides in Switzerland throughout the time frame of your stay and 50% off all other train rides (like Top of Europe). Here is a PDF with the validity map. It is hard to distinguish between first or second class on regional trains throughout Switzerland. You can really only see the differences on the ICE (intercity express) trains where the seats are wider and the cabins are quieter. There is no meal service included in first class on Swiss Trains so there really isn’t value there. Sometimes SBB will have sales on first class tickets that make them not much more expensive than second class, but in most instances it isn’t worth the trouble. As expected hotels are expensive in Switzerland and hotel points redemption are rare outside of the major cities. So Airbnb/VRBO really are your best bet especially when traveling with family. You can easily save a lot of money by picking up some groceries at a nearby Co-Op (or Coop). Not only that, but some of these chalets can be more affordable and provide you with fantastic views of landscapes you won’t get while staying at hotels. While there are many individual companies out there renting out properties, most of them have now listed their properties on Airbnb/VRBO, making it convenient and easy to search and pay for properties. Should I visit the Top of Europe (Jungfraujoch)? Short Answer: How do you spell tourist trap in Swiss-German? Jungfraujoch. For some reason this question always makes its way into my conversations with people about Switzerland. Everyone seems to want to go to Top of Europe and think it could be the highlight of their visit to Switzerland. Truth of the matter is that it’s really not much different from the type of view you would get at the top of Gornergrat, Matterhorn Glacier Paradise, or Schilthorn. Two of these destinations (Schilthorn/Glacier Paradise) are even included in your Swiss Travel Pass. So why would you pay 114 CHF more just to see something similar or see absolutely nothing as it is in most cases? Let’s also point out that you will be among a huge of throng of tour groups up there, which can make the experience even more unpleasant. However,if you are intent on going there make sure to look at the live camera feed (link here) before you go. If you see that it is really cloudy up there, it’s likely that you won’t see anything. TIP: For your best shot at seeing something, go in the morning! Side Note: The Swiss Travel Bureau probably doesn’t wish me to tell you this because it appears to be one of their biggest tourist traps (they even have the highest Lindt Shop up there now).